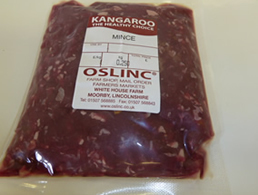 Kangaroo mince, low in fat, full of flavour for that healthy gourmet meal (250g). A healthy alternative in any beef or lamb recipe. Supplied fresh in 250g packs and suitable for home freezing.